With so many personalized gift ideas where do you start? You’ve done your research and you are convinced that corporate gifts that are personalized create a much more powerful impact as compared to generic business gifts. Problem is you are not sure which item to choose as your promotional product. With such a wide variety of products available at very competitive prices, it is easy to get overwhelmed. Is it better to give away lanyards or would the pens be more useful? Would your recipient appreciate a food gift or would a custom mug be better appreciated? If you are looking for help to come up with personalized gift ideas, you’ve come to the right place. I’ve been in the promotional gifts business a long time and so far from over 16 years experience, seen what is most effective. I’ve studied the different trends and what are the factors that go into choosing the perfect business gift for different companies. Here are a few tips and ideas that will help you master the art of gifting in style. Naturally the general profile of your customers will depend upon the product or the service that you are offering. If you are marketing t-shirts showing images of the popular ‘boy bands’, you know that your typical customer is likely to be young, probably in their teens or early twenties and predominantly female. If the product you are selling is anti-wrinkle cream, the majority of your clients will be older adults, whereas if it is some type of shaving cream or after shave, your clients will typically be male. When choosing a promotional product, try and visualize what the majority of your clients would be like. Are the majority of your clients younger or older individuals? What percentage are likely to be men and women respectively? Sometimes companies just randomly pick an economical product without any thought about who it will be given to or the impression it will create. Not taking the trouble to ascertain the likes and dislikes of their clients, leads to disappointment in the overall effectiveness of the campaign. Clients can tell when some thought and care has gone into choosing their gifts. Understanding your recipients and choosing gifts that are most appropriate for them will make your gifts that much more unique, thoughtful and special. Don’t just presume you have all the answers when it comes to picking the right corporate gift. Sometimes there are so many more dynamics involved that will influence the reaction of your recipients to your gift. If you really want to nail it down and get it right, spend some time talking to corporate gift consultants as well as to family and friends. Listen to their ideas and suggestions or alternatively, conduct a survey and ask your clients outright. Observe what other companies and organisations are giving away and see what their recipients are saying about the gift and about the company that gave them the item. Of course, you do not want to give out the same item but it is a good way to observe the reaction of their recipients when they received their gift. Even if you do decide to give away the same item, you will make it unique by personalizing it with your brand name and logo as well as your company slogan. Look for different ways that you can present your gift so that it looks even more special. This could be in the form of special packaging and perhaps used as a key part of a client visit and handing the gift to them personally. When searching for personalized gift ideas, attend a few trade exhibitions, conferences and business events and take a good look at what are the items being used. You’ll get some pretty good ideas from these kinds of occasions. When brainstorming personalized gift ideas, think ‘useful’ and ‘durable’. Is the person receiving the gift likely to use it on a regular basis? There really is no point gifting anybody something that they are not likely to use. If you have a flexible budget, you could choose different items for different categories of clients.However, if you are on a tight budget, make sure you choose something that has universal appeal and could be used by everybody, whether male, female, young or old. Another factor you will want to consider is whether or not the item is durable enough to stand the test of time. If the gift you are giving breaks or stops functioning after a few days of use, it will be counterproductive and a waste of money. It will not give a good impression of your company and would have been better if you hadn’t given the gift in the first place. Good quality doesn’t have to be expensive, it just might take a bit of research to find the most appropriate item matching your requirements. One final thing remains to be done after you have chosen your business gift and that is personalizing it. One of the simplest ways to do this is by including your company name and logo as well as your contact details on the item. If there is more space, you can even include the company slogan or other marketing message. From personal experience I have found that the most effective and memorable gifts have been the ones that are personalized to the recipient. With the advances in digital technology for printing, engraving, embroidery and other personalisation, it has become much easier and more cost effective to individually customise a gift. These are some recent examples. Naturally our suppliers want us to sell their products. The most effective way of making this work is to encourage us to use the products ourselves first. Once we have trialled the product, found them useful and discovered the unique selling points (USPs), it becomes more natural to mention these to clients when they are looking for appropriate gift ideas. 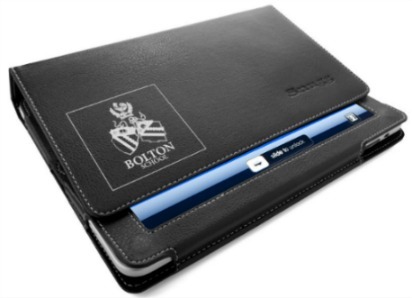 Personalised iPad case – we have a recently started marketing a range of high quality iPad and tablet cases. My supplier knows that I use an iPad in the course of my presentations to clients. A few weeks ago they sent me a sample of one of the new cases in a very smart leather effect material. Of course it’s not unusual to receive product samples so why was this so special. I was impressed at the quality but it wasn’t until I opened the case up that I realized that they had personalised it with my name by laser engraving it into the leather material. Well that was it, I immediately took my iPad out of its old case and fitted it into this smart new one with my name on. Need I say more!? Personalised metal pens – one of our regular suppliers came to visit. One of their main strengths is digital printing and laser engraving on a wide range of their own products such as keyrings, bags, pens and other personal business accessories. He then proceeded to present me and each of my team with a pack of metal pens. We were very pleased, always nice to receive some more samples. The difference was that on inspecting them they were each engraved with our company details and ‘presented by’ with each individuals name and surname, effectively a great alternative to a business card. Needless to say we were all very impressed and these items are now at front of our minds when making recommendations to clients. Desk easel calendars – go beyond normal personalisation just with a logo and develop a more emotive relationship with your clients, with digitally printed photo images incorporating your client’s individual name into each image. Without a doubt these will take pride of place on your client’s desk. Why not try one of these ideas out with a selection of your top clients, see how effective it is to get personal! These are just three simple, but very effective ideas. People not only love to see their own name but combined with a useful product, it is the perfect combination. Just think about when a winner receives an award which is personalised with their name, how great does this make them feel. It’s a similar concept. Once you have selected your products, you only need to provide a list of your client’s name in an Excel spreadsheet or even a text list in Word and the can use this to individually personalise each and every gift and at a very modest cost. Baseball caps, polo shirts, fleece jackets and other clothing. There are several personalized gift ideas you can make use of to give your corporate gift a look that is distinctive and unique. When choosing promotional products for your company, it is always a good idea to go for items that are durable, useful and most appropriate to the profile of your average client. Instead of using the scattergun approach and sending out as much low cost merchandise as you can and see ‘what sticks’. Be targeted, go for better quality and be more personal, you’ll be amazed at the results. So hopefully, you've found this information on personalized gift ideas helpful. If need further advice or need even more information please contact us and we'll be glad to help you!